On Tuesday, Attorney Tim Burns, Circuit Judge Rebecca Dallet, and Circuit Judge Michael Screnock competed in the nonpartisan primary for the seat of retiring Justice Michael Gableman on the Wisconsin Supreme Court. According to the Associated Press, Screnock received 46 percent of the primary vote, Dallet 36 percent, and Burns 18 percent. As the top two vote getters, Dallet and Screnock will face off in the general election on April 3rd. Spending on television ads for the primary exceeded $470,000, according to estimates provided to the Brennan Center by Kantar Media/CMAG, with Dallet spending over $181,000 on television ads and Burns over $139,000. While Screnock did not purchase television ads in the primary, an outside special interest group, Wisconsin Manufacturers and Commerce Issue Mobilization Committee, spent over $166,000 on ads asserting Screnock “has a record of throwing the book at murderers, abusers and predators” and thanking Screnock for "keeping Wisconsin families safe." 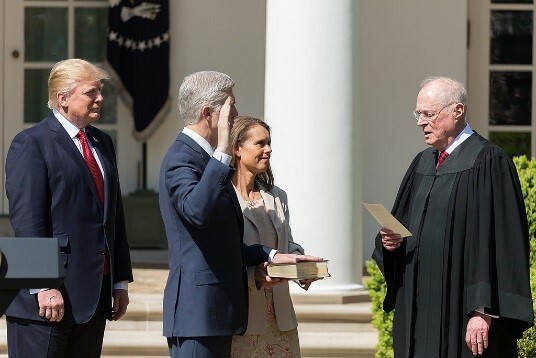 These nominees have the potential to significantly impact the makeup of the federal judiciary: Trump had more circuit court judges confirmed in his first year than any other president. The blue slip, a policy adopted in 1917, has changed over time, but, for the past 10 years, required both home state senators to submit “blue slips” in order for the Senate Judiciary Committee to consider a judicial nominee from their state. Without both blue slips, nomination proceedings halted. Blue slips worked to ensure the White House consulted with home state senators on judicial nominations. Chairman Grassley argued that the White House considered Baldwin’s candidates, but chose Brennan instead, and explained that missing blue slips would only preclude action on a circuit court nominee if the White House failed to consult with home state senators. Brennan must face a full Senate vote to be confirmed. The federal judiciary has begun adopting changes to encourage reporting of sexual harassment, and is examining implementing additional changes. 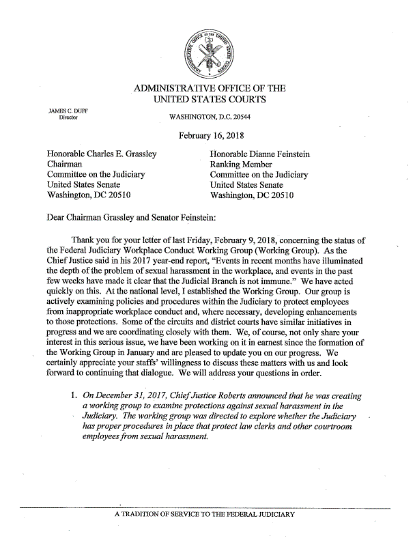 Zapotosky reports that Chief Justice John Roberts announced in December that “the court would undertake an initiative to ensure there were proper procedures in place to protect law clerks and other court employees from sexual harassment.” Roberts’ working group will release its recommendations and findings by May 1st.